Shop for unique gifts that will be sure to please your honey! We have complimentary parking ramps and surface lots that make shopping and dining convenient and simple. Arezzo - Valentine's Dinner for 2 on Feb. 14. The first 25 reservations booked that mention this ad will receive a Valentine surprise. Also - Tuscan 5-Course Wine Dinner Feb 1 at 6 p.m. Superbowl Sunday, $25 Brick-Oven Pizza Takeout Package. Book your reservations today at 612-285-7444. Red Cow - Red Cow is running Valentine’s Day specials from Friday, Feb. 10 until Tuesday Feb. 14! They will also be taking a limited amount of reservations for Valentine’s Day evening. Call Red Cow at 612-767-4411 to make a reservation. 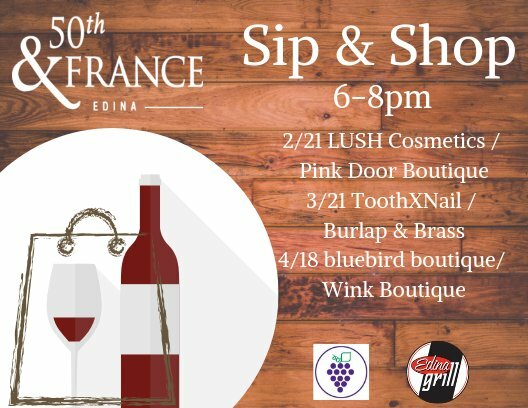 Menu: Scallops Walnut & Goat Cheese Croquettes, Cranberry Gastrique Lobster Burger Tarragon Aioli, Bibb Lettuce, Bacon, Tomato Chocolate Budino Amarena Cherries, Hazelnut, Ice Cream, Sea Salt. Pig & Fiddle - Valentine's Day Four Course Dinner for 2, $55. For years, Pig & Fiddle has been known for its quaint & cozy offerings and being considered a Valentine’s Day destination. So much so that they have created a four-course Valentine’s Day Couple’s Menu, complete with all the essentials for $55. Special starts Saturday, February, 11th through Valentine's Day from 3-10 p.m. Make your reservation today 612-354-2678. Corset Styling - New jewelry line Original Hardware now available at Corset Styling. Handcrafted, made in Colorado using recycled sterling silver, conflict-free gemstones and ethically-sourced materials. Pictured: Labradorite stones and leather necklace; sterling silver/yellow bronze and raw diamondes necklace; Raw diamondes earrings. She will love these one-of-a-kind pieces. Ask about Corset's free gift wrapping. Burlap & Brass - Burlap & Brass has got you covered this Valentine's Day with a Jessica Matrasko Jewelry Trunk Show - February 11 from 11-3 p.m. And for that sweet tooth- Sugarfina! Who can say no to Champagne Gummy bears and Dark Chocolate Sea Salt Caramels? So many amazing candies just came in! Fringe Accessories - Fringe offers gifts that last longer than flowers or chocolate, you can wear them every day and they always fit. Join Fringe in the store for gift giving assistance or personal indulgence. You will be delighted by how far your budget takes you at Fringe. Gift cards also available. R.F. Moeller Jeweler - Diamond studs are a timeless gift! With so many choices for size, cut, color, and clarity, there is something for everyone. Plus, R.F. Moeller Jeweler studs come with a lifetime trade-in, trade-up guarantee. You can trade your R.F. Moeller diamond studs in for something new anytime and you’ll receive 100% of your purchase price back in trade. bluebird boutique - Amuse Society Merci Lace Bracelette. bumbershute - Iro Izya top that is perfect for date-night. Grethen House - Grethen House would love to help you this Valentine’s Day. Find a special V-Day outfit, or the perfect gift for your partner! A La Mode Boutique - Spoil your love. Valentine's Special purchase $100 gift certificate for yourself *or add an additional $20 to your love's gift certificate. Valid for gift certificate purchases Feb. 1-Feb. 14. Denny Kemp Salon - Purchase a gift card for $50 (or more) and receive a complimentary Kerastase travel bag filled with samples from Kerastase, Shu Uemura, and R+CO product lines while supplies last! Lush Cosmetics - Who's the apple of your eye? Whoever they are, they'll be swept off their feet with this gorgeous gift. Inside they'll find four treats that are perfect for creating romantic moments. Get skin silky-soft with Prince Charming Shower Cream's vanilla-pomegranate lathers and Love You, Love You Lots Soap's rose-lemon embrace. Scrub lips with The Kiss Lip Scrub, then settle in for a massage with Love Spell Massage Bar's intoxicating rose perfume. Parc - Shop all natural and organic apothecary collection from Herbivore Botanicals, Grown Alchemist and more at Parc this Valentine's Day. Parc's picks include this Rose Hibiscus Hydrating Face Mist, all natural lavender Sea Mist Hair Spritzer and Olive leaf & Plantago Extract Hydra-Restore Cream Face Cleanser online or in-store. YogaFit Linden Hills - Saturday, February 11 – Special Valentine’s Day Burn Class – drinks and snacks 2 p.m. Class at 2 p.m. Wine and snacks starting at 3 p.m. Bone Adventure - Head to Bone Adventure for tasty dog cookies for your furry valentines, and get $5 off any retail purchase when you buy their signature canvas tote between February 1-14. College Nannies & Tutors - Free Enrollment in College Nannies Sitter Service. Download the app, My Sitters and get started. Code: 50th $149 Value. Valid until February 17, 2017. Pacifier - Bath bombs aren't just for grown-ups! Give your kiddo the gift of a fun bath time this Valentine's Day with Pacifier's Very Valentine and Monkey Farts bath bombs. $6 each or 3 for $15. Cooks of Crocus Hill - Everything you love about a cast-iron cocotte with an adorable stove-to-table heart shape. Perfect for a home-cooked Valentine's Day meal with your sweetie! Date Night: Talk about a date night to remember! Create and eat a romantic dinner and make some unique Valentine's memories. Romantic dinners not your thing? Cooks also has Valentine's Brunch and even has some V-day classes for kids! Learn more about classes here. Edina Liquor - Six Romantic Wines for $14.99 - Toast your Valentine with this staff-selected vinos. Prices good through Feb. 14, 2017. All 750 mL. Gruet Brut Bright and crisp, it’s a true classic. 49M Cremant Blanc de Blanc Brut Pop open 49,000,000 bubbles! Josh Pinot Noir - this lush red pairs perfectly with a romantic pasta dinner. J Pinot Gris Crisp - bright with a kiss of minerality. Chateau Routas Rose - a pale pink import hailing from the heart of Provence, France. Gemma Luna Moscato - delightfully sweet and packaged in a beautiful, pearly teal bottle. Sur La Table - February 9th Amore Italia Event:Stop by Sur La Table for an exclusive event celebrating all things Italy. Learn how to make fresh homemade pasta, enter to win fabulous prizes and pick up a free* recipe guide featuring some of our favorite Italian recipes. *while supplies last. Learn more about the event here. Pick up sweet Valentine's gift like the coffee mug pictured as well! Recipe ideas for Valentine's Day desserts from Lunds & Byerlys.